Melissa Locker at vanityfair.com reports on the finding of a lost Sherlock Holmes film with the original stage actor who defined the character during his time. 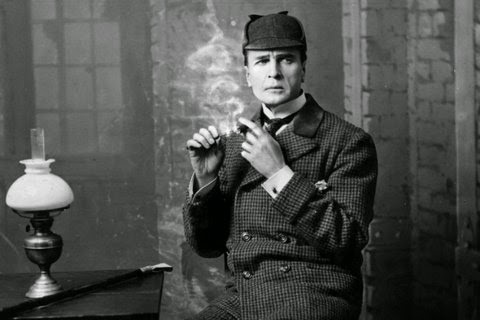 Long before Benedict Cumberbatch or Robert Downey Jr. played the famed detective, Sherlock Holmes was the domain of American actor and playwright William Gillette, who left an indelible mark on the character. Now, some sleuthing has uncovered the only known film capturing Gillette's portrayal of the Baker Street detective, which the San Francisco Silent Film Festival calls a "vital missing link in the portrayal of Holmes on film." The silent movie, made in 1916 and titled Sherlock Holmes, combines elements of several Sherlock stories. It had been lost for decades, misfiled in the vaults of the Cinémathèque Française film archive in Paris. The newly rediscovered film has French subtitles and annotations implying that the black-and-white film was meant to be colorized before being distributed to French markets. According to the BBC, staff at the archive came across the long-lost film while cataloguing the thousands of nitrate film reels in its collection.